Once, when I was in the third grade, my mother came to me in tears. She started to explain a dream she had the night before. In the dream, I was denied a ride home from school by all of my friends because I was undocumented. Before that day, she had never really faced the effects that our family’s undocumented status would have on her kids’ lives and opportunities. My parents’ degrees as accountants in Mexico have been irrelevant here in America, where they both work in fast food restaurants. All of their schooling, work, and livelihood now means nothing. They feel ostracized in a country that had not welcomed them with open arms to begin with. Our life in America has been filled with both struggles and blind faith. My parents would do anything for our family. And I owe to them to achieve my dreams in America, the only country I’ve ever really known. My status didn’t start to really take a toll on my life until I turned 16. Before then, it was something that I knew but didn’t really have to face. I’ve always had a very close group of friends, great schools to attend, and a bed to sleep in. Before 16, I’d gotten to do everything else that everyone got to do. In high school I was part of National Honor Society, Judicial State of America, Athletic Training, Health Occupations Students of America, and Student Senate. But, given my undocumented status, things like driving, getting a job, and attending college all seemed to be distant, unachievable possibilities. Then came DACA. The program provided me with the chance to get a job, build a future, and seize the opportunity to follow my dreams and help others in the process. It made me feel empowered and unafraid of contributing my ideas and passions to this country. Now, through the grace of God, the hard work of my parents and older sister, DACA, and TheDream.US scholarship, I bear the proud title of first generation college student, the first in both our immediate and extended family to attend a university in America. I am starting my college career at the University of Houston. I plan to study Exercise Science, and would love to work with athletes. 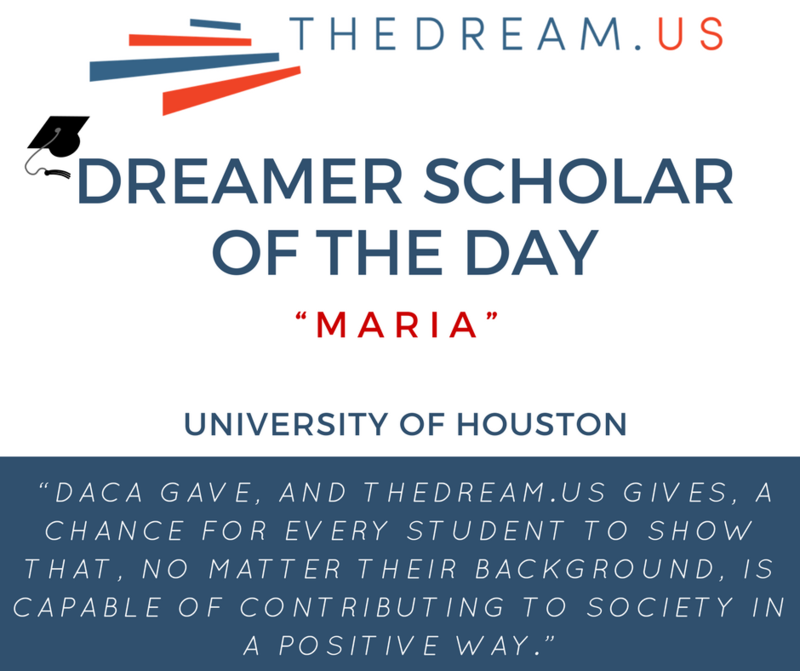 DACA gave, and TheDream.US gives, a chance for every student to show that, no matter their background, is capable of contributing to society in a positive way. If DACA is revoked and legislation is not passed, I could be forced to move back to a country that I do not know and do not call home.